recruitment from 11-08-2018 to 30-08-2018. Official website to submit the application form online is www.peb.mp.gov.in. There are total 890 Jail Prahari Posts in this MPPEB Recruitment 2018. Candidates selection is based on written exam, physical tests and documents verification. Written Exam dates are 29-08-2018 and 30-08-2018 for this MPPEB Jail Prahari Jobs. 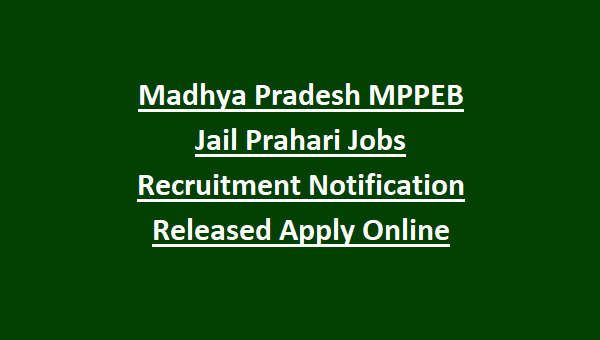 Exam Pattern, Exam Syllabus, online application form procedure, age limits, physical tests and other details related to this MPPEB Jail Prahari Jobs recruitment is given below. There are total 890 Jail Prahari Jobs in Jail Vibhag recruitment of MPPEB. 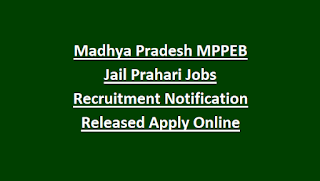 Candidates must have qualified 12th class or HSC for applying this MP Jail Prahari Jobs. For General Male age limits are 18-30 years. For Female general upper age limit is 40 years. For OBC/SC/ST Male candidates upper age limit is 35 years. For Female OBC/ST/ST candidates upper age limit is 45 years. For General candidates application fee is Rs.500/- and for others application fee is Rs.250/-. Candidates selection is based on 3 stages. Written Exam for this MP Jail Prahari jobs will be conducted for 200 marks. Written Exam duration is 3 hours. Total 200 objective type multiple choice questions will be given. Candidates must have qualify written exam with a good merit to get eligible for physical tests. Apply online through www.peb.mp.gov.in website for this MPPEB Jail Prahari Jobs. Candidates must have required physical standards to apply online. 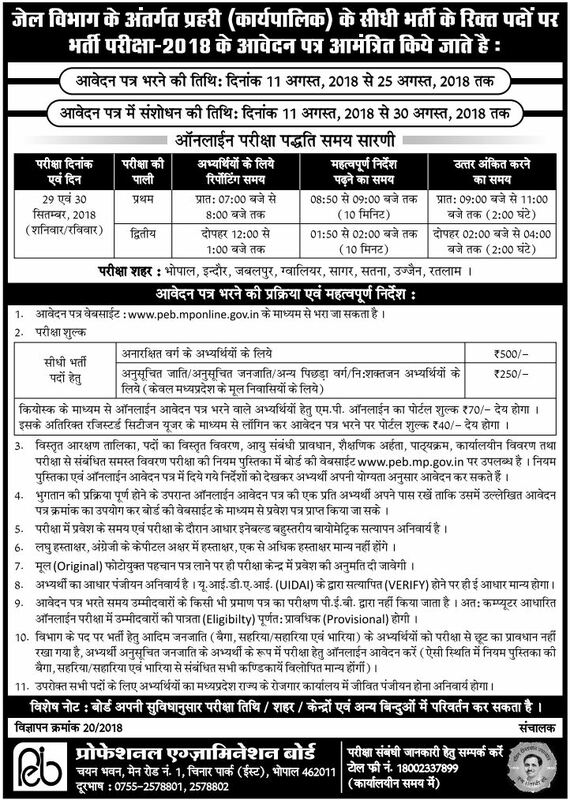 Last date to apply online for this MP jail Prahari jobs is 25-08-2018.